When you add a modern page to a site, you can add and customize web parts, which are the building blocks of your page. This article describes the People web part. Who's on the team? What are they responsible for? How can I contact them? It's easy to answer these questions for your readers with the People web part. 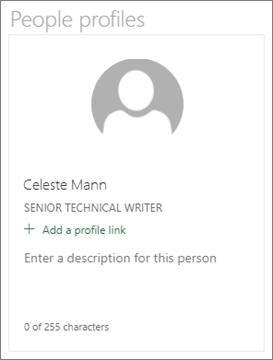 It can show the photos, contact information, and more of the people in your organization. Click +, and then select People from the list of web parts. You can change the title of the web part by clicking the text that says People profiles and typing over it. Enter a name or partial name in the box. A list of matching results will display, and you can pick the person you want. Then click Add profile. Continue entering names and selecting profiles until you are done. You can choose to show more or less information by selecting the type of card to show. "Compact" cards show a picture (if one is available) and the person's name or email address, as in the image above. The "descriptive" layout shows a picture, name or email, title (if available), and an optional link and description, as shown in the image below. Hover over the existing people web part, and click Edit web part . In the toolbox on the right, select Compact or Descriptive. 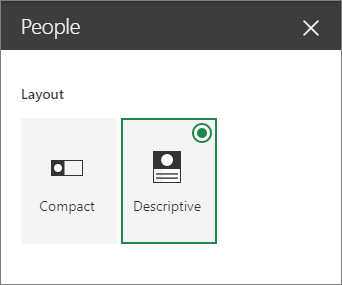 To reorder people profiles, just drag and drop each one to your desired positions using the Move button. You can also reorder people using Ctrl + Left or Ctrl + Right arrow keys.